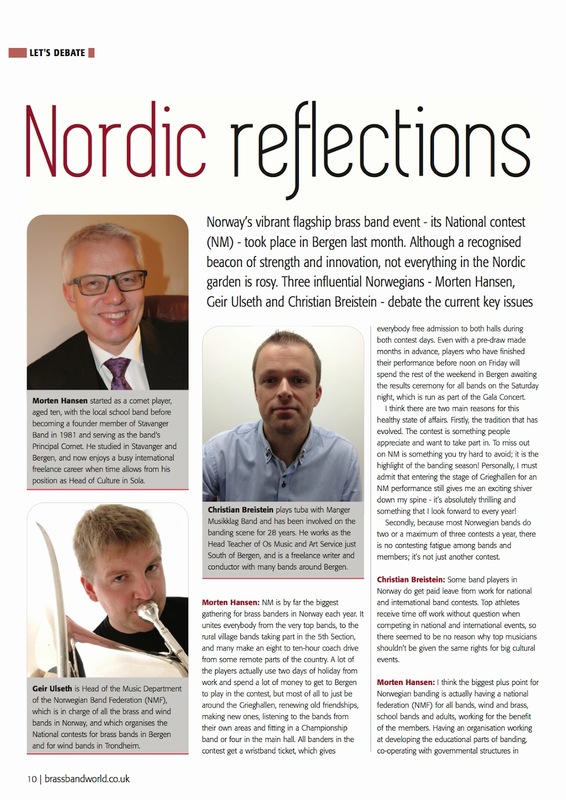 Morten Hansen: NM is by far the biggest gathering for brass banders in Norway each year. It unites everybody from the very top bands, to the rural village bands taking part in the 5th Section, and many make an eight to ten-hour coach drive from some remote parts of the country. A lot of the players actually use two days of holiday from work and spend a lot of money to get to Bergen to play in the contest, but most of all to just be around the Grieghallen, renewing old friendships, making new ones, listening to the bands from their own areas and fitting in a Championship band or four in the main hall. All banders in the contest get a wristband ticket, which gives everybody free admission to both halls during both contest days. Even with a pre-draw made months in advance, players who have finished their performance before noon on Friday will spend the rest of the weekend in Bergen awaiting the results ceremony for all bands on the Saturday night, which is run as part of the Gala Concert. I think there are two main reasons for this healthy state of affairs. Firstly, the tradition that has evolved. The contest is something people appreciate and want to take part in. To miss out on NM is something you try hard to avoid; it is the highlight of the banding season! Personally, I must admit that entering the stage of Grieghallen for an NM performance still gives me an exciting shiver down my spine - it’s absolutely thrilling and something that I look forward to every year! Secondly, because most Norwegian bands do two or a maximum of three contests a year, there is no contesting fatigue among bands and members; it’s not just another contest. Christian Breistein: Some band players in Norway do get paid leave from work for national and international band contests. Top athletes receive time off work without question when competing in national and international events, so there seemed to be no reason why top musicians shouldn’t be given the same rights for big cultural events. And the NMF owns and runs the National Championship, which again means that the bands actually own both the contest and the title, and have a democratic route to the decisions about how the federation itself and, of course, the contest is run. Geir Ulseth: The band scene in Norway has some good friends in key government seats, but we still depend on other sponsors and membership fees from all our member bands. We have managed to establish some good possibilities by applying to the Department of Culture - for example: new commissions for test-pieces, 10 million Norwegian Kroner (£1m) to buy instruments every year and some money in support of every band from our National Lottery company. But still the cash flows mainly in the direction from the bands and the NMF back into the state's coffers because of the tax we all pay, which always outstrips what we get back! So we are not satisfied until we can turn this the other way. But we are happy with what we get and work systematically for more money. That is the big advantage of having a strong and big federation - the Department of Culture listens to us when we book a meeting and tell our story. So it will come I think! To read more subscribe to the current issue of Brass Band World, using the secure PayPal link above to receive your special 25% online discount.